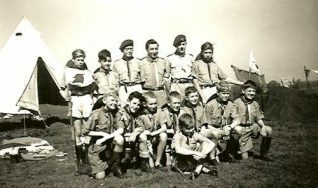 The Reverend Chown of St Paul’s was responsible for the running of the 11th Brighton Scouts Group and Cubs in the area and was a very popular figure in the local community. The scout hall was behind the main church (St Paul’s) and was very popular with the local lads, particularly in the fifties and early sixties when scouting was at its height! 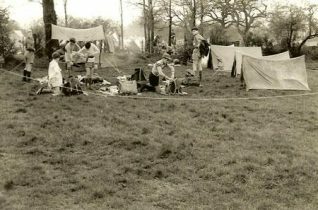 One of the yearly tasks was “Bob a Job Week” when the lads would converge on the local community and try and relieve then of a shilling for the task performed. The Scout or Cub who collected the most amounts for charity was normally rewarded for their hard work with a merit badge. Most of the lads were well known to the local people and were normally given a tip of top on the shilling. So it was always a popular week with the lads, as sixpence would buy you more chips than you could carry at the local fish ‘n’ chip shop (Bardsleys) in those days! Following the tradition of scouting the 11th Brighton were keen campers and attended many of the local scout camps in the area and represented the town in many of the World-Wide Scout Jamboree’s. 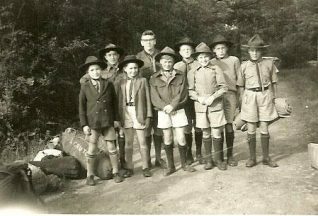 I was in the 11th scout troop. 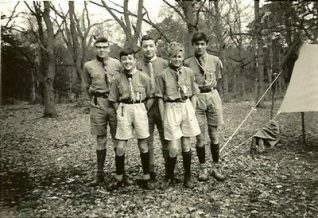 It was run by two brothers Dennis and Fred South who lived in Compton Road, they were helped by Ian Gravett. My brother John was in Gannet group, they were all named after sea birds. We often played at Wilson Avenue, on the flint pitch there. Beforehand, we would assemble at the bus stop in Viaduct Road. I remember camping at Parkwood which I am glad to see is still going strong.